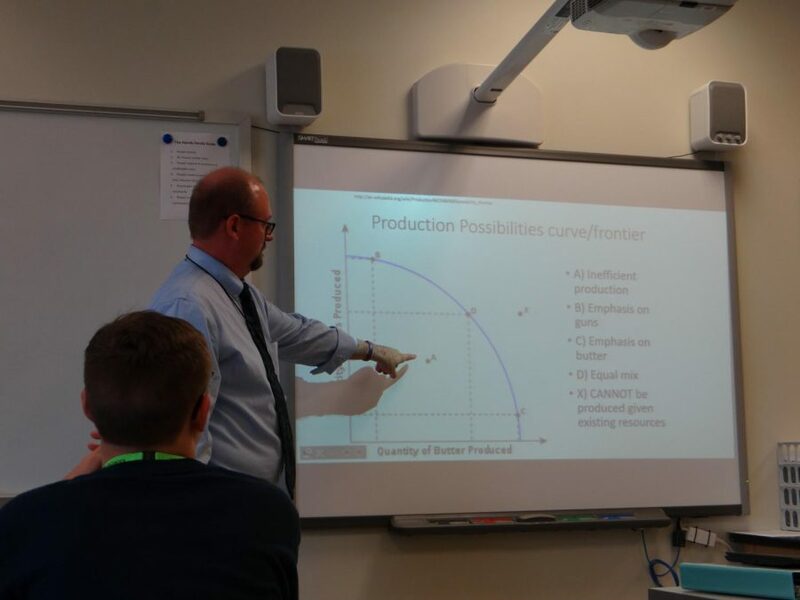 Mr. Tim Dye teaches his economics class about the Production Possibilities Curve (Photo by Ximena Alaniz). Familiar to the district, Kathe Proctor has taught German at both Perry Meridian Middle School and Southport Middle School. Having lived in multiple states, Mexico, the Philippines, and Switzerland, Proctor brings a new light to Perry Meridian’s cultural melting pot. Although spending his teaching career teaching thus far at Southport High School, PMHS alum Nick Henninger is already loved by many PM staff members and students. Henninger has coached freshman football at PMHS for nine years, and is embracing his new position as a freshman and sophomore English teacher. Entering his 42nd year as an educator, Mark James has embraced his role as a Falcon. James also has taken the position of head varsity basketball coach this year at PMHS. Though new to Perry, James’ experience, which includes leading Ben Davis to the Class 4A 2017 state championship, will reap benefits on the Falcon program. Bryson Davis-Johnson is taking on many positions at Perry Meridian this year. He will be teaching Health, Advanced Health, and swimming. One of the building’s biggest Disney fans, Aimee Hultman is teaching business classes this year at PM. As well as being an educator in school, Hultman also teaches dance and owns her own dance studio in Avon, Indiana. “I’m very tired on some days, but I love it,” she says. With a Master’s degree in business, Hultman is a magical addition to our staff. Ryan McDonald has been welcomed as a new member of Perry Meridian High School’s Special Education program. In his free time, McDonald loves to watch movies and take care of his three rescued hound dogs. With an outgoing personality and a welcoming smile, McDonald is excited to start the school year. Perry Township graduate Tim Dye is PM’s new Economics teacher. Dye has adapted to the Falcon spirit. Dye has been teaching social studies courses for twenty- two years and was an assistant principal for one year at Brownsburg High School. Even though Dye’s family works at Southport, he is more than ready to become a Falcon. Michigan native Zach Ervin serves as PM’s new assistant principal. Ervin credits his interest in education to a program he was involved in at Columbia University which helped him obtain his masters in math and science. Ervin became interested in administration by attending a Colombia University program for principals. Working in IPS, he gained experiences that led him to become PM’s assistant principal. Ervin is currently a part of team 2019 but encourages all students to stop by and visit. Kyle Ballard is a new addition to Perry Meridian as a business teacher and in the athletics department. Ballard will be an assistant coach for the boys and girls basketball teams. Ballard stems from a family of educators who influenced him to pursue a career in education. He has previously taught in Indianapolis, ranging from seventh grade to high school classes. Jake Banwart is PM’s new, head baseball coach. Banwart is the owner of Extra Innings Indy South, which is a baseball training facility open for all ages. Along with becoming a coach, Banwart joins the social studies department, teaching Psychology and Government. This year will be his fifth year teaching. Perry Meridian welcomes honorary athlete Chris Massaro.He graduated with a B.S in in Exercise Science in the spring of 2016. Massaro later earned his master’s degree from University of Indianapolis in spring of 2018, he is now PM’s new strength and conditioning coach. Perry Meridian welcomes its only second generation Mexican-American Spanish teacher Rosalilia Stewart. As a first generation college graduate, Stewart attended Marian University and earned her degree in graphic design. She later completed her Masters in Secondary Education. Stewart previously taught Spanish for ten years at IPS schools and recently worked as an administrative associate at a preschool.